This TechNote briefly describes the Command and Control Unified Battlespace Environment (CUBE), its capabilities, and its value to ESC and other services acquiring systems that need to interoperate with Air Force systems. The 1991 Gulf War emphasized the importance of command and control systems and the need for them to work in less than ideal conditions with a variety of multinational systems. In 1994, ESC and MITRE conducted Fort Franklin, a simulated warfighting environment. It demonstrated the integration and interoperability of command and control systems and how they could lead to improvements in military operations. 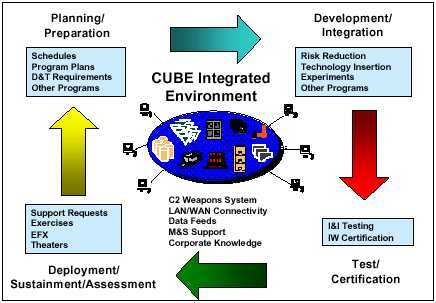 After these temporary demonstrations, ending with Fort Franklin IV in August 1995, ESC established the Command and Control Unified Battlespace Environment (CUBE) in January 1996. Executive Director for Platform Thomas "Skip" Saunders of The MITRE Corporation oversees the MITRE CUBE support team. As Skip explains, "The CUBE provides an environment where programs can solve technical problems associated with integration and interoperability, test the functionality of new systems, and explore the feasibility of new technologies supporting the Integrated C2 Weapon System." The CUBE was originally founded to help ESC improve automated systems support to the Combined Air Operations Center at Vicenza, Italy, which is responsible for battle management of air operations in Bosnia. Since then, the CUBE has extended its mission to supporting integration and interoperability engineering and test for all of ESC, hosting innovation and technology insertion activities, and continuing to facilitate warfighter support. The CUBE offers a combination of hardware and software systems, local and wide area networks, and data feeds from active systems in the field such as AWACS and Joint STARS, or simulated feeds from the ESC Modeling and Simulation Center (MASC). (See Table.) The CUBE also offers staff with technical expertise and knowledge about information systems, and lessons learned about integration and interoperability. CUBE Project Leader Bruce Czulada stresses that, "The CUBE is blessed with a diverse and outstanding technical team primarily from the Center for Air Force Command and Control Systems (CAFC2S) and the Center for Integrated Intelligence Systems (CIIS). It also has tremendous support from the Corporation as a whole, which is critically important because the CUBE has ESC-wide integration and interoperability responsibilities." When asked, "Is the CUBE like Plug-and-Play?" Bruce responded, "Not exactly. This environment needs to be tailored to the needs of the programs. Most recently, we helped the Expeditionary Force Experiment (EFX) team members solve integration problems encountered during the development spirals leading up to the September 1998 experiment. We have about two-thirds of the C2 Weapon System’s major components (core capabilities) in place and new ones are being acquired. If a program has to test the technical feasibility of a product that fits into the present architecture, we can accommodate it in a short period of time. If the program needs are different, we’ll make adjustments. Essentially, the CUBE can be configured for most programs, depending on their requirements." · Transition of the MITRE developed Multi-Source Integration Intelligence Analysis (MSIIA) prototype to the operational environment at the COAC to solicit user feedback. · Integration of the CAOC intelligence cell from standalone into a networked system. · Migration to new systems and applications. · Implementation of guard technology to secure system access EFX 98. This program used the CUBE to great advantage during spirals 1 and 2 to reduce risks to the fielded system. · A datawall that can simultaneously display video inputs from several sources interactively The CUBE also provided the EFX team with valuable lessons learned from previous activities in networking, communications, and collaboration technologies. Federated Battle Laboratory and AF Information Warfare Center (IWC). In May and June 1998, the CUBE team helped these organizations evaluate IW monitoring and assessment tools. This experiment enabled the Air Force to demonstrate its IW tools to the joint community and gain valuable lessons learned. The examples above show how the CUBE provides the environment and engineering support for programs preparing for final testing and certification. By testing products in the CUBE as they are being developed, programs can take advantage of the latest technologies while reducing risks and program costs. If a product doesn’t work, developers can work to find solutions without negatively affecting the actual system or warfighter in the field. In this environment, contractors working with programs can gain insight into the technical feasibility of their product working in the C2 system. One of Lockheed Martin’s Senior Staff Software Engineers Stephen Dunford reported that, "The CUBE proved to be a real time saver for solving integration problems while preparing for EFX ‘98. I was able to set up my software in this controlled environment and remove the bugs. When we went live, we had a product that worked successfully." When and How Should Programs Use the CUBE? Programs should be using the CUBE throughout their development cycles. Initial program planning is a good time to make the first visit. Then CUBE opportunities can be incorporated in the RFP package and all documentation for the program. If a program is going to be part of ESC’s integrated weapons system or must interoperate with any component of that capability, it should be tested with the CUBE’s help. Testing can be done at the CUBE or from another location by using the available communications media. CUBE staff are available to help with planning test/experiment schedules, refining test/test environment requirements, and coordinating or running the test/experiment.